Besides helping participants look and feel their best, Corporate Wellness Program builds camaraderie, promotes a sustained commitment to fitness, and gives people the tools they need to live and work in balance. Click here to contact Barb so we can assess your company’s needs and provide a customized quote. What is the Corporate Wellness Program? A total body training program designed to give people all the tools they need to live happier, healthier and in balance. Who is the Corporate Wellness Program? 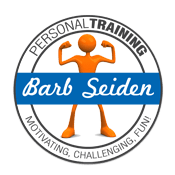 After spending many years working in corporate human resources and organization development, Barb Seiden put her passion for health and wellness at the center of her professional life and became a personal trainer in 2007. Barb has a B.S. in Business Administration, B.S. in Kinesiology, and an M.Ed. in Education. She is also a Certified Adapted Physical Educator and works extensively with people who have a variety of disabilities. How does Corporate Wellness Program benefit corporate clients? The well-rounded, challenging, and consistent workouts offer participants the opportunity to release, rebalance, and recuperate from the often intense demands of the business day. In addition, participants interact with co-workers in a different context, creating opportunities for connections among employees who might not otherwise come into contact with one another. We also make it easy to implement. Trainers will create appointments and schedules for assessments, workouts and evaluations. She will provide the motivation and tools to ensure participants stay on target and reach their fitness goals. She can help develop and implement incentive programs to give the extra push some participants need. How much time would each workout take away from people’s jobs? Our corporate programs are designed by and for highly experienced business professionals who are short on time and looking to make the most of every minute they devote to their personal fitness. Workouts can be offered 1 to 5 days per week during AM or PM hours. We work around your schedule. Our goal during each one-hour workout session is to leave participants feeling invigorated and ready to return to the challenges of their jobs. Does it matter if some participants are not yet physically fit? Each workout is designed for people of all ages, abilities and fitness levels. We will never ask anyone to complete exercises that go beyond their capacity! To that end, we ask each participant to take part in fitness assessments at the beginning of the program so we can properly gauge their fitness level and capabilities. In addition, trainers demonstrate both high-intensity and low-intensity versions of exercises and vary the workouts on a daily basis to minimize fatigue and injury. Workouts include (but are not limited to) components of cardiovascular endurance, muscular strength and endurance, flexibility and balance exercises. We incorporate dynamic warm-ups and stretching, circuit training, speed/agility/power drills, interval training and functional exercises. Our trainers also utilize a wide range of equipment to add variety to the program, including free weights, fitness tubing, stability balls, agility ladders, jump ropes, and TRX Suspension Training. What are other organizations doing with their corporate wellness programs? 50+ percent of U.S. companies are operating corporate wellness programs. Coca-Cola’s fitness program recouped $500 per year per employee, despite the fact that only 60% of their staff was enrolled. Corporate wellness statistics from Prudential Insurance reveals a benefit expense of $312 per person enrolled in their wellness system, but $574 per non-enrolled employee. At the Coors, Brewing Company, corporate wellness statistics showed a savings of $5.50 per $1 spent on fitness, with a positive side-effect of participant absenteeism dropping by 18%. For every $1 you invest in a company wellness program, you will get $3 back!!! Barb Seiden designs programs to meet the needs of each client on an individual basis. Click here to contact Barb so we can assess your company’s needs and provide a customized quote.